Green factor: Recycling for bottles. Styrofoam containers. When you’re a mobile food vendor, you have to use all the available tools at your disposal to make your (literally) small business as visible as possible. Mexigo Cabana puts their best digital foot forward with a presence on multiple social media platforms, along with a Street Food App profile, albeit not always the most active as of late. Physically, they’re quite visible as well, with a prominent location at a busy intersection, and they’re orange. Really, really orange. For good measure, there’s a couple orange caution lights spinning on top of the truck. So, if you’ve driven past the corner of Bank and Walkley in the past couple years and haven’t seen them, you probably shouldn’t be driving. I stopped by one mid-afternoon, on a cool, brisk day. The chatty, friendly owner quickly gave me a sample of his purportedly popular chili. Ranging in five sizes from the small (12oz) to the super size (32oz), I can see why it’s in such demand; hearty and rich, with tender meat and perfectly cooked beans, it’s a great bite. While it would have been tempting to order some to brace myself against both the cold and hunger for the next half day, I was here for Mexican fare. Before I was even done the chili though, I received a sample of Mexigo’s house-made hot sauce and some tortilla chips. It was slightly fruity and had a heat that kicked in on the back end, but still left my taste buds intact – this stuff was good. For a food truck, their menu is both physically large, and has a lot of items on it. Varying degrees of authentic Mexican/Tex-Mex grub is available – nachos, flautas, tacos, enchiladas, tostadas and quesadillas were the tip of the zesty iceberg. Not leaving less adventurous eaters out to dry, they also offer fries, poutine, burgers, and if you don’t care about stained clothes or indigestion, you can add chili to pretty much anything. I wanted to sample a few items but still be able to fit into my pants, so I ordered the beef enchiladas ($8.95) and tacked on a lone chicken taco ($4.50). The covered section attached to the truck provided a nice bit of shelter during my short wait for the food, and it’s probably even more appreciated during the winter, as Mexigo is bravely open year-round. I soon had my food in hand, and set up shop on one of the picnic tables out front (they’re also orange). 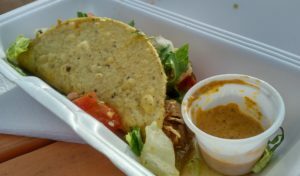 The base of the chicken taco was a fried, house-made, corn tortilla. Its crunch was a nice contrast to the rest of the taco, but any distinct corn flavour got lost in the fryer. A soft-shelled taco would have been better for mess-control, and that’s where the best corn tortillas really shine. The chicken was moist to the point of being watery; I’ve seen this happen a lot with pulled pork, and I’m not sure of the cause, but it dilutes the flavour and simply isn’t very pleasant. The fillings were decidedly Tex-Mex, with Monterey Jack cheese, lettuce and salsa; it was all fresh and tasty, but I can do without all that stuff if the meat and tortillas are up to snuff. 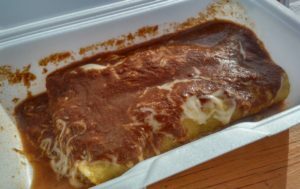 The enchiladas were a tasty hot mess, with a hearty dose of cheese and a rich, lightly smoky enchilada sauce. Unfortunately, the beef suffered the same condition as the chicken, although not quite to the same degree. 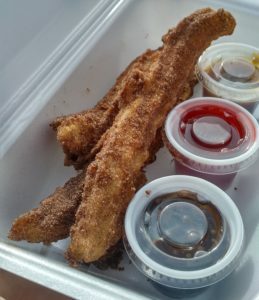 I knew I couldn’t go to a Mexican food truck and not get my wife some churros ($5.95), so once I had finished my other food, I went back to the truck and put in an order. Re-heating them in the oven when she came home, they were as good as being fresh out of the fryer – crispy on the outside and moist on the inside. They might not have been the prettiest churros, but they were good. They also came with a generous amount of dipping sauces: three 1oz cups of chocolate, caramel, and strawberry. All were winners in my book, although the chocolate was too dark a variety for my wife’s liking. 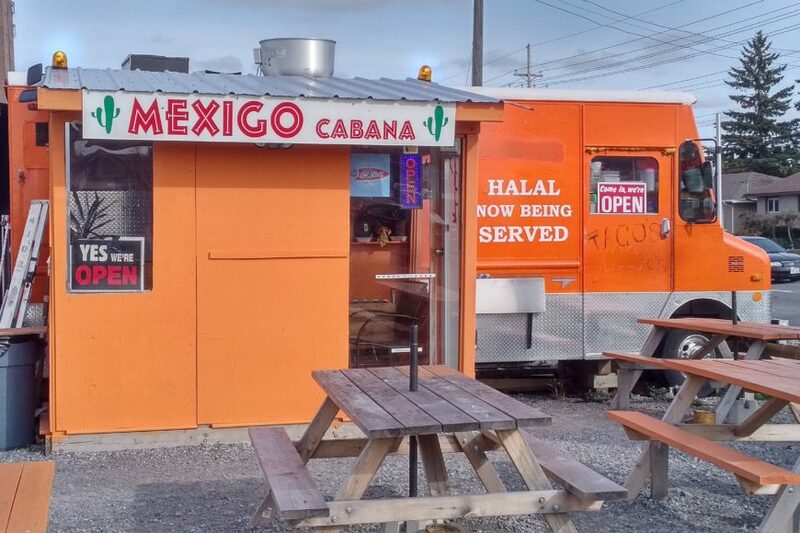 I love that there’s a stronger Latin American food presence here in Ottawa than my former abode, with a decent amount of both brick-and-mortars, and food trucks. The great staff at Mexigo really has me pulling for them, but some tweaks need to be made before their product is on par with the competition. Until then, stick with some chili and churros and you won’t go wrong.